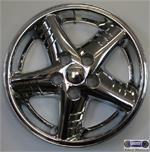 6533B, Used Rims, 16X6-1/2, 5LUG 115MM, 99-'05, PONTIAC, GRAND AM, CHROME ALUM, 5 SPOKE. Home > Rims ( Wheels ) > 6533b, Used Rims, 16X6-1/2, 5 LUG 115MM, 99-05, PONTIAC, GRAND AM, CHROME CLAD, ALUM, 5 SPOKE. A= PAINTED SILVER B= CHROME CLAD C=ALL CHROME. 6533b, Used Rims, 16X6-1/2, 5 LUG 115MM, 99-05, PONTIAC, GRAND AM, CHROME CLAD (CHROME REFLECTS EVERYTHING), ALUM, 5 SPOKE. 6533c, Used Rims, 16X6-1/2, 5 LUG 115MM, 99-05, PONTIAC, GRAND AM, CHROME, ALUM, 5 SPOKE. A= PAINTED SILVER B= CHROME CLAD C=ALL CHROME.